S’mores Krispie Treats – the perfect easy summer treat that you can make year-round with all the classic flavors that you want. This post contains affiliate links, which, if you buy something I make a little money, and it doesn’t cost you any extra. During the summer months I often end up with some leftover marshmallows or graham crackers. And, well, sometimes there’s a box of cereal in the cupboard too. A few months ago I decided to make up some S’mores Krispie Treats out of all that. I tested out a couple different ways and with different ingredients, but in the end, I went pretty S’mores traditional. I think the classic flavors are so perfect! I used the classic S’mores ingredient of Hershey’s bars, but you could totally use chocolate chips instead. If you’re like me, dark chocolate is a must, and these S’mores Krispie Treats are great with dark chocolate as well. I left the graham crackers in some larger pieces so there would be nice pretty chunks in the mix. Also, save some crushed grahams for garnishing the top. 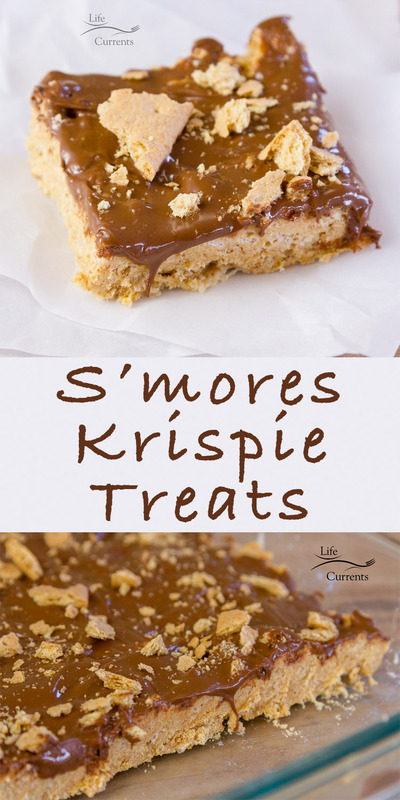 These S’mores Krispie Treats would be perfect fun for any party, potluck, or gathering. Kids and adults are all going to love these! Butter a 13 x 9-inch pan. In large saucepan melt butter over low heat. Add marshmallows and stir until completely melted. Remove from heat. Add puffed rice cereal and crushed grahams. Stir until well coated. Using buttered hands or a spatula evenly press mixture into the buttered. Cool. Place chocolate pieces in a medium bowl, and microwave on high in 30 second increments, stirring after each time, until completely melted. Pour melted chocolate over graham mixture, and spread evenly. Garnish with additional crushed graham crackers.